Avon Napoleonic Fellowship: Gå På! 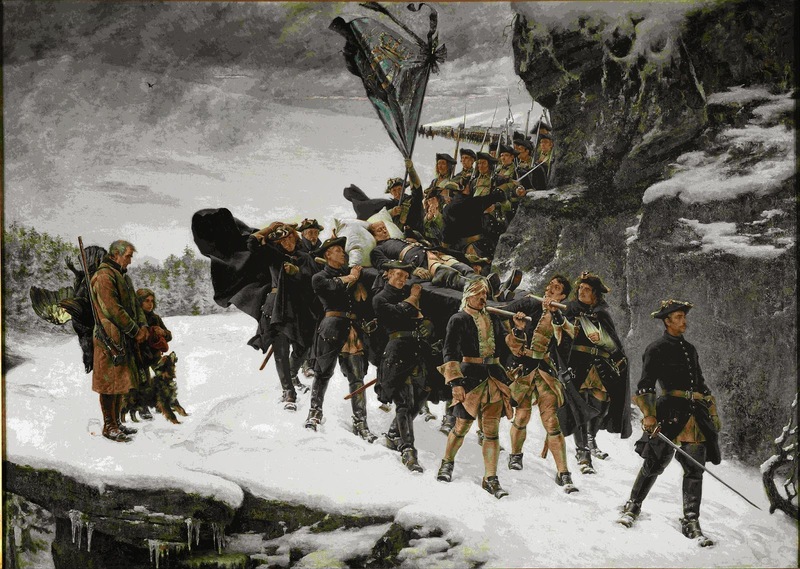 I was first introduced to the Great Northern War and Charles XII of Sweden as a teenager when my father suggested that I read his copy of E.M. Almedingen’s The Lion of the North. I was captivated. Almedingen vividly, passionately and somewhat romantically relates the story of the reluctant boy-King, brought to the fore, to manhood and to the status of legend by a war that was not of his making, but was begun by neighbours, keen to take advantage of a power vacuum presented by the death of his father so as to exact revenge on the powerful Swedes. I was immediately interested to wargame the period, but time, budget and a desire to remain focussed on building our small forces of Napoleonics prevented me. In the 90s I first saw the new 1/72nd figures of the period; “if only they had been available in my youth”, I thought. With the gathering of the ‘three amigos’ that became the ANF, and our focus on the ‘one true scale’, purchasing some of the lovely Zvezda, Strelets and Mars figures for this period was almost a ’given’. The trouble was, which rules to use? I purchased Polemos: Great Northern War a couple of years ago. 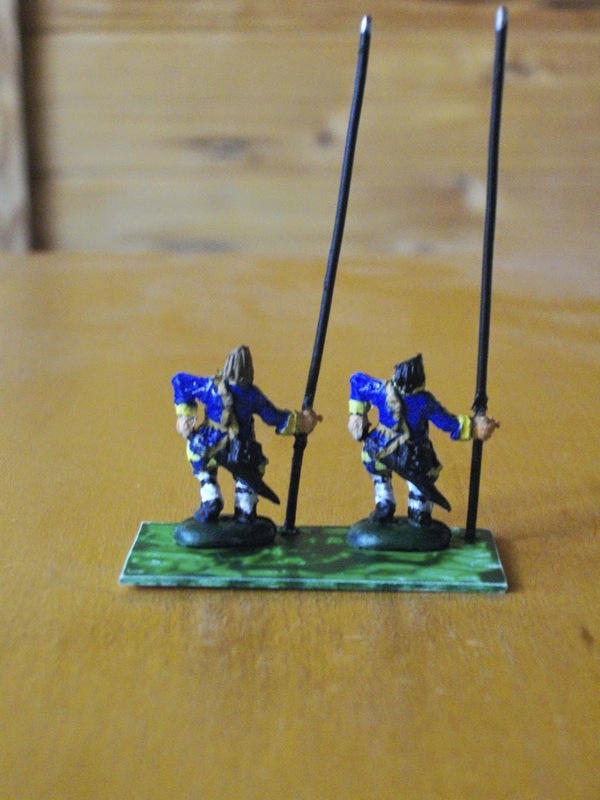 While written specifically for 6 mm armies, they seem like a definite possibility, but our focus on the ‘main game’ of the Napoleonic bicentennial delayed painting figures and so any play-test. Now, with the bicentennial approaching the climax of Waterloo, we have allowed our focus to slip a bit so as to engage some of the other periods of interest to us all. For the Lace Wars, Age of Reason have impressed us so far, as Julian has described. However, they are not really written for the specific nuances and idiosyncrasies of the Great Northern War. Enter GåPå. Having read a little about the rules, I ordered a copy of GåPå from Caliver Books, hoping that, this time, they would be a set that we’d use and not another of the many that merely decorate the shelves. My hopes increased when I saw the excellent series of posts reviewing the rules and describing a play-test on the blog Battle of Ramillies. The rule book arrived in the post a week ago (thanks Dave!) and I immediately began to read them. I am most impressed. They are the kind of rules that get one excited about the prospect of playing a game (something that rules like Shako and Impetus did, but Grand Battery did not do). GåPå have numerous aspects that are immediately appealing to me. There is no removal of figures, unit status being classified by up to three ‘steps’ (à la Fire and Fury). The quality of a unit is determined by one number, the troop quality (TQ), much like the MR in Shako or the VBU in Impetus. The rules use a flexible figure, time and ground scale to enable units, armies and battles to be scaled up and down (suggestions are made to get you started and/or to enable you to relate your existing basing). The rule book is clearly laid out and well written. Sections have colour-coded headings, ‘sidebar’ boxes provide a summary of key tests related to each section and links between them are clear and, most importantly, consistent! The descriptions of specific rules are enhanced by numerous examples and historical notes. The only ‘eye-candy’ are several tasteful, black and white vignettes from Lars-Eric Högland and Åke Sallnås’ marvellous books on the uniforms of the Great Northern War. All distances are given in paces to facilitate the scaling. This also enables distances and ranges to immediately relate to ‘reality’. Suggested frontage of a base of infantry (nominally a company) is 50 paces; the same for a squadron of cavalry and battery of artillery (other than heavy guns, for which 75 paces is suggested). Three infantry bases commonly comprise a battalion and up to 12 squadrons for a regiment of cavalry (depending on type), but these are variable to represent differently sized units, especially in historical lists; e.g. the range is 1–7 bases for a unit of infantry. The number of figures per base may be adjusted to suit the scale of figures, budget and aesthetic preferences of the players and may even be different for different players. Unsurprisingly, the suggested base sizes match exactly with those that we have settled on for Age of Reason. The suggested basing of four infantry, two cavalry and two to four artillerists and a gun model per base also match-up. This also means that we can use a ‘default’ ground scale of 1 pace to 1 mm, making measurements simple. The capabilities of units are specified by their size, type and TQ. The size is simply the number of bases, which relates to the number of troops present and also determines the fire points and close combat strength as well as the ’steps’ available. Sixteen troop types are specified (six infantry, six cavalry and four artillery). The most common are those such as line infantry—the standard; assault infantry—grenadiers or Swedish infantry with pike & musket; horse—most European cavalry and dragoons; shock horse—Swedish and English cavalry, lancers or Polish hussars. Others, such as eastern horse, skirmishing infantry, skirmishing cavalry or close combat infantry are specifically to represent troops of the Ottoman armies or Jacobite infantry (the latter type). TQ is scaled at six grades (rabble < green < trained < veteran < élite < fanatic). It is used to represent training, experience, élan and the professionalism of the officers. The majority of infantry fit into veteran (e.g. Swedish and English infantry) or trained (most regulars), with some being green (most Russian infantry). The upper TQ grades are reserved for troops driven by religious or other fervour and most guards, while the lowest grade is for untrained levy troops or peasants. The base TQ grade may be temporarily increased by having a commander attached, defending fortifications or by high fire discipline (optional rule), or reduced due to disorder, having a lower close combat value than opponents, testing for a single uncontrolled unit, being fatigued or fighting in condensed line. TQ tests are used throughout the rules: uncontrolled unit test (discussed later in this post), reaction to being charged, impact of ‘hits’ from firing, close combat and rallying. Four levels of results are possible, ranging from decisive success to decisive failure. The outcome of the test is cross-reference with the troop-type and/or situation on a specific test table to determine the outcome. It all seems pretty simple and rather elegant. The turn sequence incorporates a pre-battle section (determining the opposing forces, which side is the attacker and placing terrain), the battle section (sequence of play on the tabletop) and a post-battle section to determine victory and pursuit. The pre- and post-battle sections are most important for fictitious games, but also makes the rules applicable for competitions (for those who like that sort of thing) and for campaigns. For example, the guidelines for setting up terrain prescribe what is required for fictitious battles, but also provides information that will be useful in designing scenarios for historical actions. The battle section of the sequence of play has phases for visibility, random events (if played), initiative determination, orders (including movement), fire, closing (moves to contact other than charges—the latter being done in the orders phase), close combat and army morale. As with many (most?) 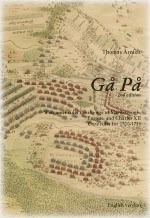 sets, the command and control system is at the heart of GåPå Army and wing (division, ‘corps’ or column) commanders are the only ones represented in play normally, but line (brigade) commanders may be added in larger games. The initiative phase determines which side will execute orders/movement first and the number of order executions in each round. This is determined by a die roll modified by the army commander’s initiative rating. The winner decides which side will move first and how many order executions, one or two, each may use in sequence until all four ‘action points’ are expired (see below). Commanders need to send orders to units or groups of units in order for them to remain under control and to act as the player desires. Command and control is by line of sight, so that commanders need to be visible and within line of sight of senior commanders to be in command and units within line of sight of their commander to be eligible to receive orders. Line of sight is blocked by terrain and units (including friendly ones)—hence the importance of the commander on the hill—but is also impacted by visibility. Under ‘normal’ conditions, visibility begins at 1200 paces, but this decreases, permanently, as the action (number of units firing) increases. Visibility is determined at the beginning of each turn. Each commander has four ‘action points’ each turn (non-cumulative). Action points (one per order execution) are expended to issue orders to a unit or group that is visible, to move the commander, to put a subordinate in command or for a subordinate to act on his own initiative. This requires the expenditure of an action point and a roll against the testing commander’s leadership value, which ranges from 1 to 5, with success on a roll equal or below. Rallying units or making an uncontrolled unit/group test (see below) do not require action points. So you can see that command and control will rapidly deteriorate as the armies come to grips—it may even be limited from the start in bad weather. That seems fine, but does it mean that we have the ‘pip’ effect of intense action in one part of the battlefield and nothing elsewhere? Arrrgh!!!!!! Fortunately not. Two rule mechanisms work against this most-disliked of rules systems (by us, at least). Firstly, groups of units in lines or columns that are within about 50 paces of one another (depending on formation) may be ordered or act as a single formation. Secondly, units and groups that are not under orders are considered to be uncontrolled units and act as determined by an uncontrolled unit test. An uncontrolled unit test is a TQ test, the result of which is cross-referenced to the situation in which the unit/group finds itself and the type of unit to determine the action. The result may be hold, advance, march, turn, cautious march, charge, pursuit, withdraw, flee, or retreat. The exact meaning of each of these options is clearly defined in the rules. Importantly, only a few are possible results in each situation. Once again, this sounds reasonably simple, quite elegant and will produce some most interesting situations that are beyond the control of the X m ‘general’! Finally, we come to determining the end of the game and victory and defeat. At the end of each turn, each side checks army (or force if several, separate contingents are present) break level. If the current number of units broken, fleeing or having fled the table, plus the value of any initially controlled terrain features that have been lost equals or exceeds the army break level (50% of the weighted total of the number of units—artillery halved, guards doubled, skirmishers ignored), that army or contingent is broken and the game is over. Prior to this level being reached, each side will go on to check wing morale and demoralisation (and similarly for lines, if in use). Wing morale is tested when losses (broken, fleeing, fled) are 1/3rd or more of the initial level. If reached, a TQ is taken for each unit, based on a single roll, with failure resulting in the unit making a flee move. The test is done each turn when it is required, so this can get pretty nasty! Wing demoralisation occurs at 50% losses. Once reached, the command will withdraw from the field. This cannot be reversed! With the end of the battle the level of victory or defeat is determined by points for losses of commands and terrain based on the type of battle that was played (determined in the pre-battle phase). With these rules I'm excited about the possibility of finally doing some games of the Great Northern War, so I'm just gonna have to slip in some Swedish units while I do my Napoleonics in preparation for Waterloo (a post about this important wargaming project will follow soon). 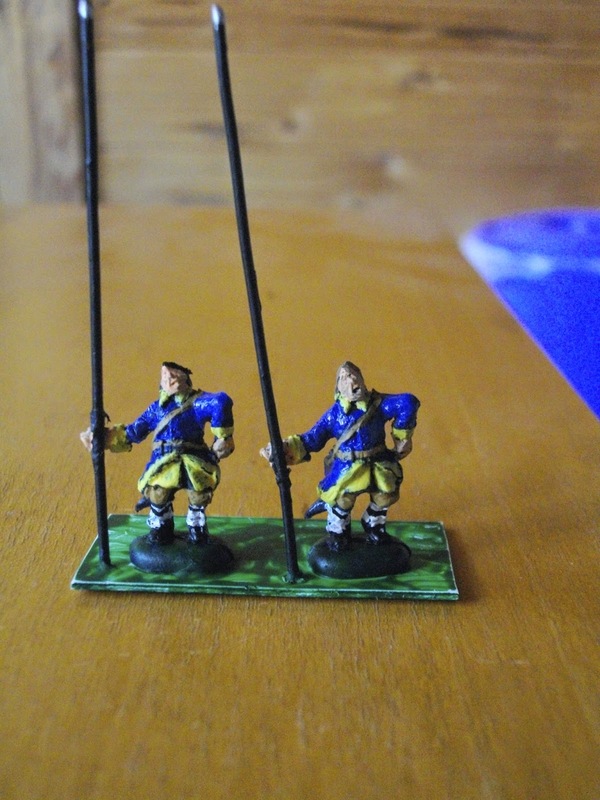 I have slipped some Swedish units into my painting production line (if one can use such a term for my rate of painting!) These 3/4-completed examples from Mars were originally casualty figures (left hand to head) that I converted to pikemen; hence them not being Karl's most handsome subjects! Terrific overview of Ga Pa, James! I have the rules but have never made it through a complete reading. No figure removal - I like that! Combat Effectiveness as one number ala Shako.Impetus - I like that! No rebasing - I really like that! Your useful summary inspires me to pull them from the shelf for a closer examination. Excellent write-up, I'm almost tempted. Go on Mark, you know that you are not wargaming enough interesting periods already! Oh no, how embarrassing. I *know* that because I read and enjoyed your posts about the Danish army in the Napoleonic Wars, in which you let that gem slip. That will teach me to try to be a smart alec! And I, for no good reason other than that I have the great fortune to be me, will be able to join in using these rules in action at the ANF, to see how they compare with AOR and Polemnos - and will be painting up GNW forces as soon as I can, there are about 1000 to be painted up. WSS, Waterloo then GNW painting - I am going to be happily busy for years - I just hope I can get Swedes to look even half as good as these! Great review James. Everything that I wanted to know. Thanks David, pleased that it was of interest. You can loan the rules if you like.